What is commonly known as an IP camera, is a camera that digitizes and processes analog images, encodes them internally, and then transmits the video information digitally over an Ethernet connection to a computer or similar device. An IP camera can have either a CMOS or a CCD sensor, and is available in the same styles as traditional surveillance cameras such as Pan/Tilt/Zoom, domes, bullets, box, infrared, covert, and wireless. IP cameras combine the capabilities of a camera with some PC functionality, do not require a direct connection to a PC to operate, and can be placed anywhere within a network. 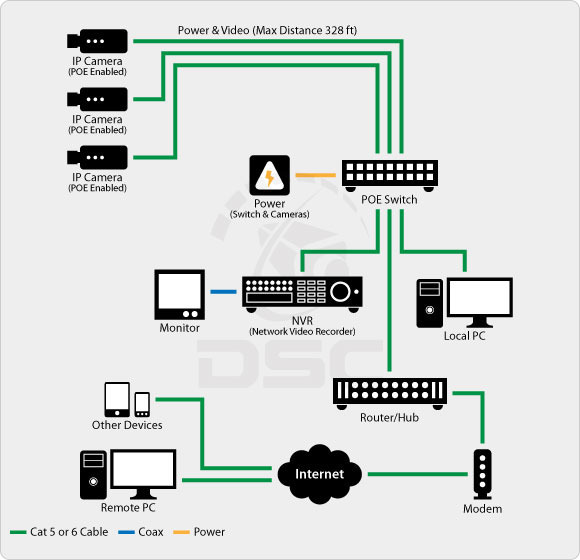 Just like any other PC on the network, an IP camera is a “network appliance”.It has its own IP address, connects directly to a wired or wireless network and requires maintenance. 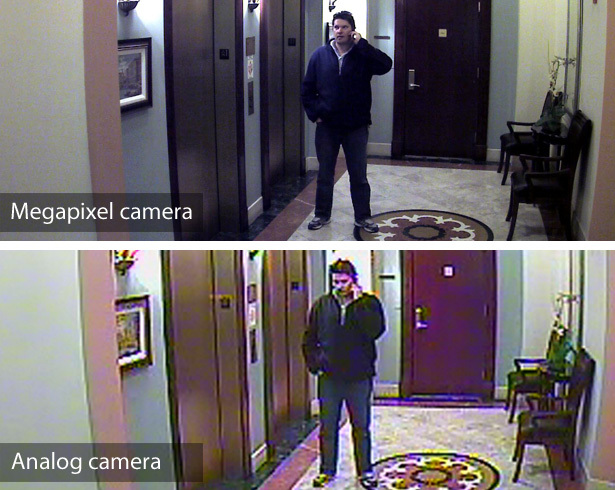 In the IP world, each network camera captures an analog image but immediately converts it to digital inside the camera. Some digital processing can happen right at the camera, such as compression and motion detection. The digital video stream is then broadcast over the local area network (LAN) using Ethernet (CAT5 or CAT6) cable. Power is supplied to the cameras through the ethernet cable via Power-Over-Ethernet (POE) adapters built into the cameras and at the (POE enabled) switch. (FYI - Older style IP cameras do not have POE built in so POE adaptors had be added. The ethernet cable for each camera is plugged into the switch which feeds into the network hub. As with all network devices, some set-up needs to be done for each network camera to set up its IP address and other identifying attributes.